Are you looking for the right electric motor? 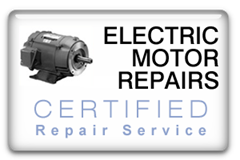 You have come to the right place, as American Electric Motors can supply you with a new motor or a refurbished motor in as little as an hour* depending on your proximity to a distribution point. This is because American Electric Motors has motor distribution points spread out all over both the United States and Canada. At American Electric Motors, our prices are extremely tough to beat. At American Electric Motor Corporation, we sell and service every make and model for both AC and DC electric motors, and gear products as well! 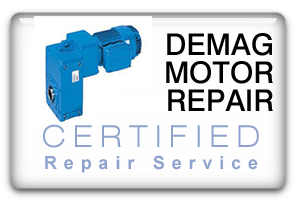 Demag Electric Motors: American Electric Motor Corporation is a proud Demag Crane motor, Demag hoist, and Demag Automation sales and service representative. American Electric offers state of the art, high efficiency replacement Demag motors for most industrial applications.American Electric is able to quote the replacement cost of most Demag electric motor, Demag creeper motor, and Demag reducer product. Contact our sales department with your current Demag TYPE, and SERIAL number from the nameplate of your existing unit for an immediate price quote.Contact our sales department today to obtain price and availability for all Demag parts, Demag electric motors, and Demag gear-reducers. We carry a complete line of single and three phase motor products ranging from sub-fractional horsepower to 2000 horsepower. 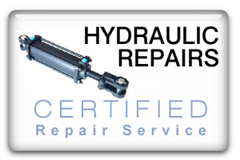 Our facilities are fully equipped using modern equipment for repair and testing which more than exceed the standards that are demanded by the industrial market of today. We are extremely proud to be able to offer distribution points spread all throughout the United States and Canada. 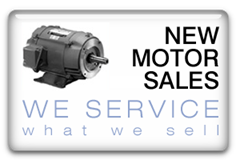 We are proud to both sell and service all AC and DC electric motor makes and models. AEG, ALLEN BRADLEY, AOSMITH, BALDOR, BELL&GOSSETT, BODINE, BROOK CROMPTON, CENTURY, CONTRAVES, DAYTON, DELCO, DEMAG, EATON, EMERSON, FASCO, GETTYS, GE, GOULD, GUSHER, INDRAMAT, INDUSTRIAL DRIVE, LEESON, LINCOLN, MAGNETEK, MARATHON, P&H, PACIFIC SCIENTIFIC, RELIANCE, REULAND, SEW EURODRIVE, SIEMENS, SPARKS, TOSHIBA, UNICO, US, Van der Graaf, VON WEISS, and many more. At the American Electric Motor Company, we are proud to have hundreds of combined years of training under our belts, with talented technicians working in all areas of motor repair. 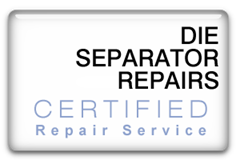 Our electric motors come equipped with a one-year service warranty, and we offer 24/7 assistance with rapid turn around times when repairing any of the products that we sell. 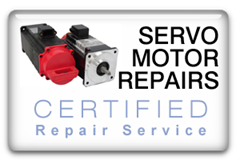 This includes small electrical motors, specialty motors and OEM motors, which can be rebuilt if necessary. 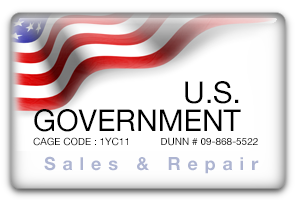 A $25-dollar inspection fee is required, but you will be allowed to approve the repair costs before you are charged for repairing your electric motor. 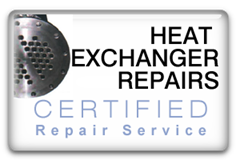 We offer full service electric motor repair on your time, which means that you can tell us when you need it and we promise to have it ready for you! All prices subject to change without notice. All orders subject to acceptance by American Electric Motors. All sales are final.